The ever popular Khyber by Tactical Research is now made in an AR-670-1 compliant Coyote Brown color for the U.S. Army's new OCP ACU uniform. This boot features a lightweight 100% cowhide suede and nylon Cordura upper for strength and durability. It features an aggressive Vibram Ibex outsole to aid in challenging tasks such as crawling, rope rapelling, and traversing on loose gravel or terrain. The TR550 features a moisture wicking lining to keep your feet comfortable and dry during intense physical activity. It comes with Belleville's patented TR-1 insole for maximum foot support and form to minimize fatigue. Got these and been wearing them for 2 weeks so I can't say much about the durability. But man are they comfortable. Very form fitting boot and not clumbsy like the boots I was coming from. My boots before were an older bair of Bates that weighted a couple pounds per boot. These TRs are much lighter and agile. I feel like I can balance much better and run more comfortably and definitely beats those clunky combat boots. They run true to size like your running shoes. My boots arrived 2 days after ordering. I noticed they did ship directly from Belleville, IL which is much closer than CA. These were some of the most comfortable boots I've worn. Virtually no break in period. Wore them for a week long CQB training course. No blisters, no problems. Excellent! I bought these while deployed to the Middle East. They do loosen up after a few days because they were tight fitting the first few days. These boots are great for the middle east where its 110+ degrees on a daily basis. My feet stay cool throughout the day and the gusseted tongue keeps sand out of the boot which is especially important here. Also, they are AR-670 compliant for uniform wear. Thanks for a great boot, Belleville! These are probably the most well designed boots I've had in a long time. The tread pattern gives incredible traction even in sand and mud. It's gotten me out of more than one sticky situation. 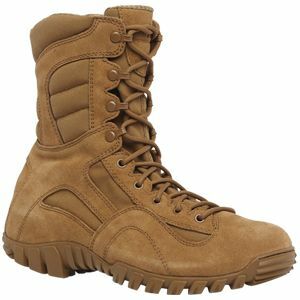 The other part I like about this boot is its tactical design gives you confidence for tasks that require agility and balance such as crossing a rope bridge or balancing on a log. Great design, great boots! Good boots. Fit true to size. Comfortable. good boots but with runs slightly small i'm a regular width so thats what i ordered but they feel tight but that may be how there supposed to fit. I like the boots but my main complaint is the quality control. I'm a size 10 in regular shoes so thats what I bought in these Khybers. The left size fit fine but the right felt tight in the toe box and just never broke in. I can't ruck in these more than a mile before my right foot starts to hurt. I'm really happy with these TR350s. I had the Rocky C4Ts and the Nike SFB in the past. I prefer a lightweight boot with a smaller profile than traditional boots. I know this comes at the cost of durability but fair enough. I have nothing but good things to say about this boot. The break in was almost non-existent. I could have worn them to work the first day. They are extremely supportive in the heel and arch area probably due to the hard plastic insert. I noticed I don't get as tired in these after rucking all day unlike the Rockys and Nikes. Quality in the leather, rubber sole, lacing, and hardware all seems good. This has been the best so far. Unless I try something better, this is my new "go to" boot. Awesome boots. Arrived fast directly from Belleville in Illinois. Comfortable right out of the box. I'm glad the Army made these compliant with AR-670-1. I like the aggressive tread design. Really digs in. I just purchased my second pair of TR350 Khybers. My first pair finally wore out after almost 18 months with the boot starting to peel apart at the front and rear of the rubber sole. They served me well after practically living day in, day out in these of 10+ hours everyday. I can't really ask for more in a boot.